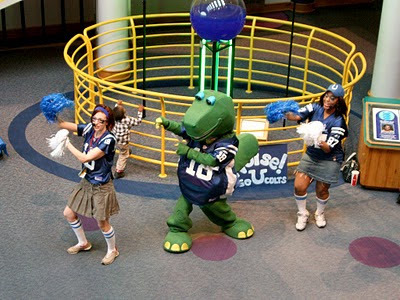 Super Bowl Sunday will be a great day to visit your local museum --- because it will be even quieter than usual. Why are so many people, even folks who don't normally follow football, more rabidly enthusiastic about watching the "Big Game" or attending a local Super Bowl event, than visiting your museum? Have you ever seen someone outside a museum scalping tickets to get inside? I'd say one possible answer lies in finding the difference between a "fan" and a "casual visitor." Fans wear logo gear all year long and have no compunction in excitedly telling total strangers how great their team is. The National Football league is, as recent news reports have detailed, even going after a traditionally neglected demographic, women 18 to 49, with great success. So how can museums create more "fans" and expand their demographic reach as well? Places like The City Museum in St. Louis have set out to become a gathering spot for their local communities and have become open to all sorts of fun ideas that are edgy enough to attract a wide, and enthusiastic audience of repeat visitors who definitely become City Museum fans. Of course all this talk of creating "museum fans" is pointless if your museum isn't really fan-worthy. Is your admissions procedure torture? Do you create core exhibits and attractions that are worth revisiting, or do you depend on the hucksterism of events that are only vaguely related to your museum's mission and purpose? What are the obstacles that prevent your visitors from becoming fans? Let's see if we can create more museum fans.